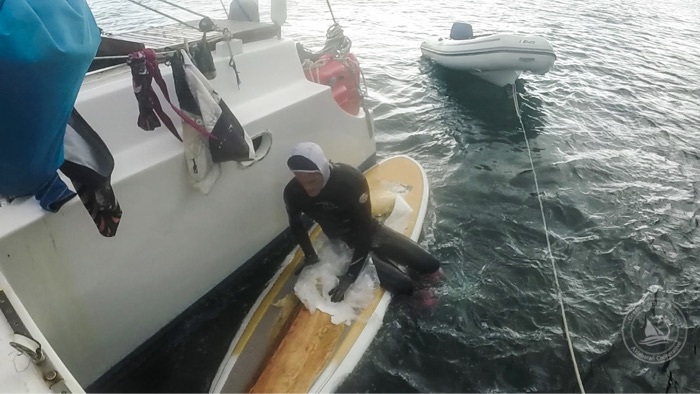 Although I would rather forget our tribulations with the boat, and just soak in the scenery of Bay of Virgins, I had to dive and evaluate the extent of the fiberglass damage that we sustained enroute to Fatu Hiva. A lot of fiberglass had delaminated from the powerful jets of water that hit the boat underway, including a section below the waterline. Delamination is a slippery slope: it can accelerate quickly. You must get rid of all the poorly attached fiberglass so that the good pieces have a chance of staying on the hull. The bottom line: we’ll need to haul out to repair the hull. If they aren’t able to haul our trimaran in Hiva Oa, the larger island to our north, then we’ll have to come up with a “bandaid” to cover the exposed wood, until we get to a larger haul out facility in the Society Islands. This would be non-ideal, and could possibly compromise the wood foundation of the boat, if left for long. So we need to do our best to fix and seal the wood, as soon as possible. Hope the boat fix goes well.